Effect of different type of organic compounds (humic acid, oxalate, ethylenediaminetetraacetic acid, nitrilotriacetic acid, phenol) on the photocatalytic removal of cyanide with TiO2 or ZnO was studied in this work with variation of the solution pH, contact time, initial cyanide concentration and type of organic compounds. Photocatalytic oxidation efficiency of cyanide with TiO2 was greatly affected by the solution pH. It increased as the solution pH decreased. Also maximum removal of cyanide by ZnO was observed near at neutral pH because of the reduced photocatalytic activity of ZnO at exceedingly low and high pH values originated from either acidic/photochemical corrosion of the catalyst and/or surface passivation with Zn(OH)2. Removal efficiency of cyanide greatly decreased in the presence of humic acid, ethylenediaminetetraacetic acid, nitrilotriacetic acid compared to that without presence of organic compound because of the competitive oxidation as well as surface blocking by relatively large organic compounds. The oxidation pattern of cyanide was better described by first-order kinetic model. Finally photocatalytic reaction with TiO2 or ZnO can be effectively applied to treat synthetic wastewater contaminated with cyanide. Cyanide (CN) is a highly toxic component, which is generated from several industrial activities such as gas production, pharmaceutical, mining, electroplating processes and coal gasification [1, 2]. It is known that wastewater generated from electroplating industry contains high concentration of cyanide . Cyanides emissions are increasing at a fast rate and cause a serious concern since they are toxic to living organisms even at very low concentrations [1, 4]. Physicochemical methods such as chlorination, electrolytic oxidation, ozonation, etc. and biological methods have been applied to remove cyanides. The generally accepted physicochemical technique for the treatment for the industrial waste containing cyanide compounds is alkaline chlorination [5–10]. The first reaction product generated from chlorination is cyanogen chloride (CNCl), a highly toxic gas having limited solubility. The toxicity of CNCl may exceed that of equal concentrations of cyanide. At an alkaline pH, CNCl hydrolyzed into the cyanate ion (CNO–), which has only limited toxicity [1, 2]. To conquer these problems, advanced oxidation processes (AOP) have been studied and are recommended as talented techniques. Overall, AOPs use hydroxyl free radical (HO.) as a strong oxidant to destroy inorganic compounds that cannot be oxidized by conventional oxidants such as oxygen, ozone and chlorine. The hydroxyl radical can be generated in aqueous solutions using UV/O3, UV/H2O2, Fe(II)/H2O2 and UV/TiO2 [11, 12]. Among these methods, photocatalytic reaction using UV/TiO2 can treat inorganic compounds and heavy metals at the same time through oxidation and adsorption process. Consequently, this method can be used as pre- or post-treatment methods to extra wastewater treatment methods because it is suitable to fit and inexpensive process in the application of wastewater treatment. TiO2 has been widely used as the form of suspension or as a thin film in water treatment [6, 8, 13]. Also ZnO has much attention because electron in valence band of ZnO can be excited at room temperature under low excitation energy. The greatest advantage of ZnO is that it absorbs over a larger fraction of the solar spectrum than that of TiO2 . The surfaces of ZnO support strong chemisorption of oxygen and are sensitive to ultraviolet (UV) light [14, 15]. The most important properties of ZnO are non-toxic in itself, providing attractive photocatalytic efficiency . Photocatalytic reaction using ZnO/UV can simultaneously treat organic compounds and metallic elements in addition to change non-biodegradable to biodegradable organic compounds [17, 18]. ZnO is used as an effective, inexpensive and nontoxic photocatalyst for the degradation of synthetic dyes, oxidation cyanide and reduction of Cr(VI) [17, 19, 20]. As wastewater generated from electroplating industry generally contains high concentration of cyanide, synthetic wastewater containing cyanide concentration ranging from 50 to 200 mg/L was used in this work . The present study investigated the effect of different type of organic compounds (humic acid (HA), oxalate, ethylenediaminetetraacetic acid (EDTA), nitrolotriacetic acid (NTA), phenol) on the photocatalytic removal of cyanide by illuminated titanium dioxide or zinc oxide nanoparticles with variation of solution pH, contact time and initial cyanide concentration. In addition, kinetic parameters were obtained by application of zero, first and second-order equations. P-25 TiO2 (an 80/20 mixture of anatase and rutile) was obtained from Degussa Corp. It has approximately spherical and non porous shape with greater than 99.5% purity. The specific surface area of the TiO2 particles was 50±15 m2/g according to Evonik-Industrial Co. Average particle size of the TiO2 particles was 21 nm. Also ZnO with greater than 99% purity was obtained from Nano Pars Lima Company in Iran. It has approximately spherical and non porous shape. Average particle size of the ZnO particles was 20 nm. Physicochemical properties of TiO2 and ZnO were summarized in Table 1. Also organic compounds with greater than 99% purity were obtained from Merck Company in Germany. All chemicals were analytical grade and solutions were prepared with deionized water (18 MΩ-cm) from a Hydro-Service reverse osmosis/ion exchange apparatus. The experimental set-up for photocatalytic reactor used in this work is schematically shown in Figure 1. A 125 W medium-pressure UV-lamp emitting maximum wavelength at 247.3 nm and light intensity equal to 1020 μw/cm2 measured by a Spectroline model DRC-100× digital radiometer combining with a DIX-365 radiation sensor (Shokofan Tosee company in Iran). The reactor consists of two compartments: the outer one can contain 2 L solution and the inner one house a UV lamp. The outer part of the reactor is a 10 L water-bath maintained at 25°C for all experiments. All photocatalytic experiments were performed with 1,000 mL solution. During experiments, the test solution in the reactor was constantly stirred. A schematic diagram of the experimental set-up for photocatalysis. where A and B is volume (mL) of standard AgNO3 of sample and of blank, respectively. All experiments were repeated three times and the average values with error percents were reported. 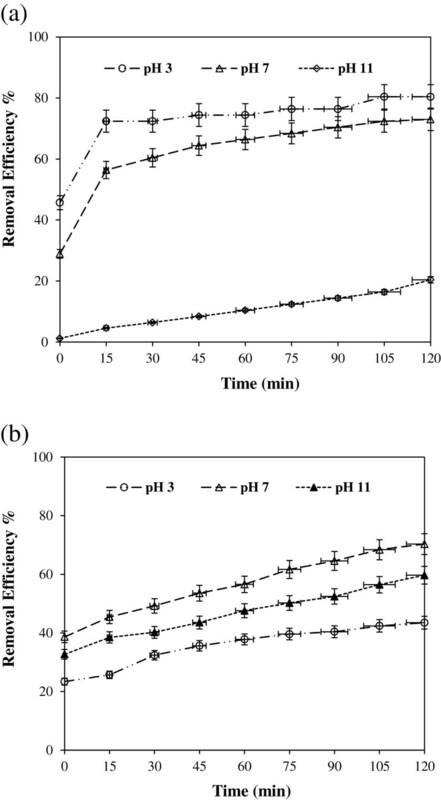 Effect of solution pH on the removal of 100 mg/L cyanide by UV/ TiO2 and UV/ZnO was investigated at constant catalyst dosage (1 g/L) by varying the initial solution pH (3, 7, 11) at different time interval. Figure 2 shows the removal of cyanide (a) by UV/ TiO2 and (b) by UV/ZnO at different solution pH. At initial condition, the removed fraction of cyanide through adsorption process ranged from 28.9% to 45.7% in UV/TiO2 system and ranged from 23.4% to 38.7% in UV/ZnO system depending on the solution pH. Cyanide adsorption onto TiO2 was greatly dependent on the solution pH compared to ZnO. Figure 2(a) shows the effect of solution pH on the removal of cyanide with UV/TiO2. Photocatalytic removal of cyanide increased as the solution pH decreased. The greatest photocatalytic removal of cyanide was observed at pH 3 over the entire reaction time. This result may be explained from combined effects of several factors such as adsorption behavior of cyanide onto metal(hydr-)oxide as well as favorable conditions for photocatalytic reaction at low pH. At high solution pH, increased negative charges on the surface of TiO2 causes difficult approach of cyanide ions to the surface of TiO2. Similar observations have also been reported previously . Other reasons are an anodic shift of the potential of positive holes and change of the speciation of dissolved CO2. As the solution pH increased above neutral pH, bicarbonate is presents as a predominant species. It is a known radical scavenge and causes depression of photocatalytic activity . Effect of solution pH on the removal of cyanide in (a) UV/TiO 2 and (b) UV/ZnO system (catalyst dosage = 1 g/L, CN = 100 mg/L). Removal of cyanide by UV/TiO2 and UV/ZnO was investigated with variation of initial cyanide concentration (50, 100, 200 mg/L) at initial pH 7 and at constant TiO2 and ZnO dosage (1 g/L). Figures 3(a) and 3(b) shows that, for all concentrations, a rapid increase of the cyanide removal was observed up to 30 min and then the slope was gradually reduced. Cyanide removal by UV alone was observed for all concentrations, suggesting photolysis of cyanide. A fraction of cyanide photolysis increased as the cyanide concentration decreased. Percent cyanide removal after 120 min by UV alone in the presence of 50, 100 and 200 mg/L cyanide was 48.7, 37.0 and 32.7%, respectively. Although cyanide removal was possible through photolysis, it was not effective, suggesting necessary of photocatalysts. Effect of initial cyanide concentration on the removal of cyanide in (a) UV/TiO 2 and (b) UV/ZnO system (pH=7, catalyst dosage=1 g/L). In the presence of photocatalysts, it can be seen that percent cyanide removal decreased as the initial cyanide concentration increased. The presumed reason is that when the initial cyanide concentration increased, more cyanide molecules can be removed on the surface of TiO2 or ZnO. The large amount of removed cyanide might have an inhibitive effect on the further photocatalytic reaction of cyanide because of the decreased adsorption sites on the TiO2 or ZnO as well as the limited oxidants on the surface of TiO2 or ZnO [25, 26]. Effect of organic compound on the removal efficiency of cyanide by UV/TiO2 and UV/ZnO was investigated in the presence of four different organic compounds. 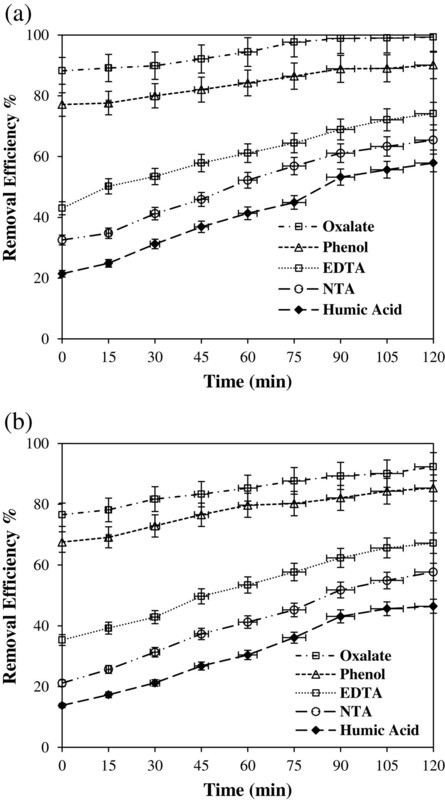 Figures 4(a) and 4(b) show that percent removal of cyanide at initial reaction is oxalate > phenol ~ EDTA ~ NTA~ HA. The removed amount of cyanide at initial reaction time in the presence of oxalate and phenol was greater than that in the absence of any organic additives shown in Figure 4(a) and 4(b). Effect of different organic compounds on the removal of cyanide in (a) UV/TiO 2 and (b) UV/ZnO system (pH=7, catalyst dosage=1 g/L, CN =100 mg/L, organic compound = 100 mg/L). The removed amount of cyanide in the presence of oxalate and phenol gradually increased and was greater than that in the absence of any organic additives over the entire reaction time. Removal efficiency of 100 mg/L cyanide without presence of organic compound increased from 28.9% at 15 min to 73% at 120 min in UV/TiO2 system and increased from 38.67% at 15 min to 70.32% at 120 min in UV/ZnO system. The removal efficiency of cyanide in the presence of oxalate increased from 88.2% at 15 min to 99.3% at 120 min in UV/TiO2 system and increased from 76.6% at 15 min to 92.3% at 120 min in UV/ZnO system, showing greatly different removal efficiency over the entire reaction time. The residual cyanide concentration after 120 min of photocatalytic reaction with illuminated TiO2 in the presence of oxalate was below the discharge standard of cyanide in USA (1.2 ppm as a maximum value in a day) or Korea (1.0 ppm). It was difficult to explain the enhanced cyanide removal in the presence of oxalate and phenol. Removal efficiency of cyanide greatly decreased in the presence of HA, EDTA and NTA compared to that without presence of organic compound because of the competitive oxidation as well as surface blocking by relatively large organic compounds. Osathaphan et al. 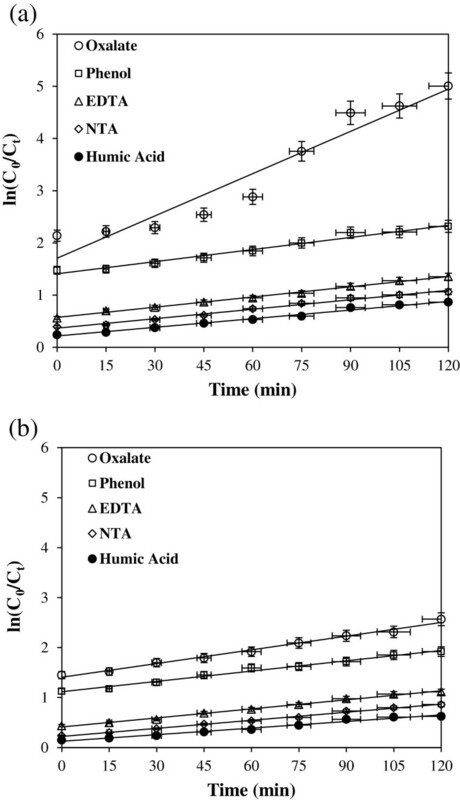 (2008) investigated kinetics of the photocatalytic oxidation of cyanide in aqueous TiO2 suspensions in the presence of EDTA (0.4-40 mM) at pH 13.0 . They reported a retardation of the cyanide removal rate in the presence of EDTA, indicating that EDTA successfully competed with cyanide for oxidizing species during the photocatalytic processes. In order to obtain the kinetic information, the experimental results in Figures 3(a) and 3(b) and 4(a) and 4(b) were fitted with zero, first and second-order equations. From this evaluation, the removal pattern was better described by first-order kinetic model. Because the initial concentration of cyanide employed in this study was low, the adsorption kinetics can be described adequately by a simplified first-order rate equation (Eq. 12). where C0 and Ct is the cyanide concentration at initial and at time t, respectively. k1 is the first-order rate constant and t is the reaction time. Figures 5(a) and 5(b) show the plot of ln[C0/Ct] versus of t for the removal of cyanide by UV/TiO2 or UV/ZnO. Figures 6(a) and 6(b) show the plot of ln[C0/Ct] versus of t for the removal of cyanide by UV/TiO2 or UV/ZnO in the presence of organic compound. Also first-order rate constants including zero- and second-order rate constants at three different concentrations of cyanide with or without presence of organic compounds are summarized in Tables 2 and 3, respectively. As the cyanide concentration increased, the rate constant in both system decreased. First-order kinetic model for cyanide removal by (a) UV/TiO 2 and (b) UV/ZnO system (pH=7, catalyst dosage=1 g/L). Removal of cyanide by UV/TiO2 or UV/ZnO increased through photocatalytic removal in the presence of organic compounds, especially oxalate. 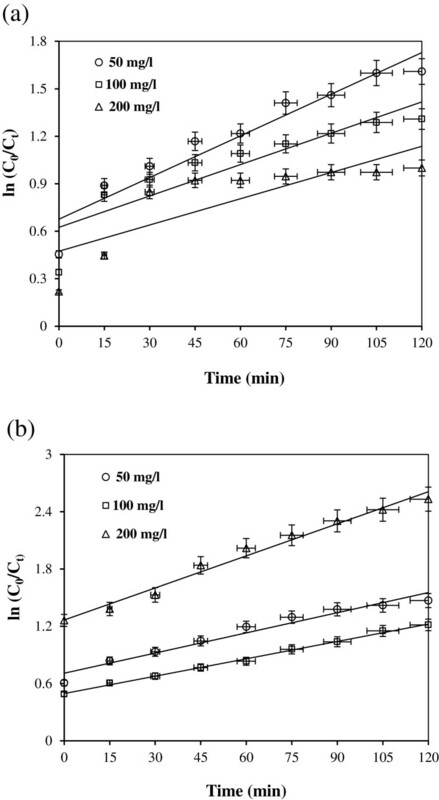 The cyanide removal decreased at higher pH because of the decreased potential difference between the conduction band of TiO2 and cyanide and the anionic-type adsorption of cyanide onto the surface of TiO2. Maximum cyanide removal was observed near at neutral pH because of the reduced photocatalytic activity of ZnO at exceedingly low and high pH values. Photocatalytic oxidation rate of cyanide was well described by the first-order kinetics. 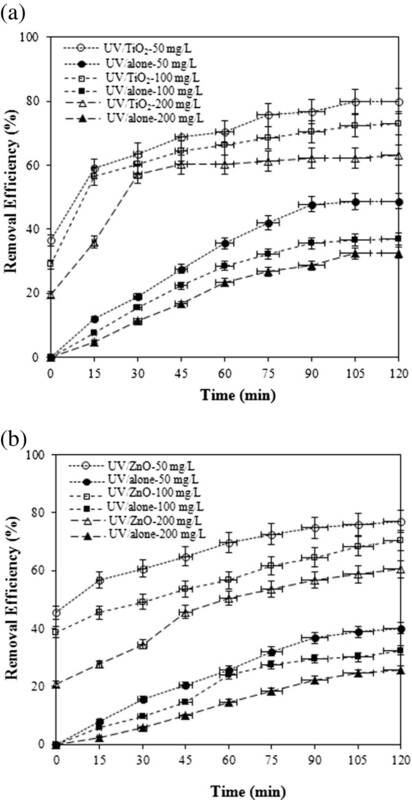 Photocatalytic reaction with UV/TiO2 and UV/ZnO in the presence oxalate can be effectively applied to treat industrial wastewater contaminated with cyanide. This work was supported by Department of Environmental Health Engineering, School of Health, Guilan University of Medical Sciences, Rasht, Iran in 2013 and was also partially supported by a Research Grant of Kwangwoon University in 2013.